1. The 20/20 Annual Report has been submitted. 2. The Grant Committee's request for an HCP grant was successful to the tune of $10,000. Carrie suggested we look at our 7 projects to see which task force is ready to go and get some on the ground as "Success breeds success". Some quick matching funds might be available with a Dining Out Book. 3. Kay has not yet contacted all the known non-profits in the area. Original list was outdated. She is to contact and obtain meeting times and forward via email to Steering Committee. Information on the 7 projects with partial IF funding should be made available to each group as well as solicit their ideas for the future. The goal of the non-profit should be integrated into their presentation and how we can work together. Face to face interaction has a better chance of success. Focus on the fact that the information we are using came from the community in the meetings in 2004. This includes letting the community feel the success. 4. MDT review - concern for small turn out. Suggested focus on community. 5. Infrastructure discussed with outcome that Ken will act as Treasurer. Our agenda should reflect approval of minutes and treasurer report with approval of expenditures. Forms to be reviewed at next meeting. 6. Discussion around getting representatives from non-profits to sit on Steering Committee. A decision must be made as to what we want from non-profits - just money or do we help with their goals as well. Kay will ask about their feeling of involvement when she makes calls. 7. Hometown Pride Days - Kay and Rita talked with Lynn and Dave and are able to get a booth to sell fried bread. Might be some way to work with or for Lynn Schurman in her booth also. We will need volunteers. Kay/Duane will send out email with request for help. Nadine said Peace has about 65 volunteers to run their pie stand each year. We will be meeting weekly until Hometown Pride to bring additional ideas to the group. Discussion on whether we should buy radio time; use public service announcements; use our local cable channel. Nadine motioned we use this as a fundraiser for our administration project, Michelle seconded, motion carried. 8. Raising matching funds through non-profits and what could be expected from the City. Carrie suggested we do our best to find another source of funds for all projects. If we are unsuccessful and project is appropriate we could as City as last resort. We need to get more visibility in Record and Times. Duane will put an article regarding grant and projects in the Record and send to Times. 9. HCP workshops were reviewed. Kay was planning to attend the one on the 38th and 29th of July but since that is Hometown Pride weekend she will be re-thinking. 10. Request for help to develop a strategy to get more people involved. 11. Land Use and Design Standards met with Council. Larry reported that it was a good meeting. There will be a couple more with the consultant. Is there a way we can help the Township and City realize their potential for the future? Avon had success with the mayor going to all the township meetings. Is that realistic for us? The community at Design Team meetings placed priority on this and only one meeting evolved. Should we consider asking the Township and City to meet with IF facilitator? To go forward we strongly feel we need to get them together. Can we get enough volunteers to run a Hometown Pride booth? Michelle Prow introduced herself as a member of the Social Committee and member of Faith in Action and a helper with VISTA volunteers. The Social Committee has successfully joined with the Rural Faith in Action group. They are approaching volunteers and are assessing their needs. They are looking for two people from each church to act as liaisons. They are submitting a grant request to CenterCare for start up costs. They are planning a big roll out in October. An example of their sign up form was passed for each attendee to copy and take to their churches/non-profits. Carrie said there are usually good financial opportunities for these causes. Carrie suggested we lay out our projects, determine potential sources of funding, determine timing, publicize and be ready to show the projects completed and time spent. "It's a good story to tell." Nadine moved adjournment, Brigetta seconded, motion carried. NEXT MEETING July 19, 8AM with Hometown Pride the focal point. After this meeting the Grant Committee will meet with Carrie. The brochure racks are in the chamber office area. All brochures can be left at the building or call for pick up. Currently 597-2794 would be that number. Governor race between Dayton and Emmer has Dayton still leading by slim margin. 2:51 PM Wednesday, Dayton leads Emmer by 8,855 votes with 100% of the precincts reporting. Based on the 1.8 million votes cast, this most likely will trigger an automatic statewide recount. Fischbach glides back to State Senate. Hosch wins State Rep 14B race. Mergen wins over Schaefer in District 3 County Commissioner race. Bachmann holds off Clark and Peterson retains US House seats. Cold Spring Mayoral race won by incumbant Doug Schmitz. Richmond elects Kron and Mathiasen for City Council. Rockville says "YES" to City Question and elects Volkmuth, Howe and Simon for council. Lieser, Leither and Demuth elected to ROCORI School Board. In this edition of the ROCORI Update, the three city administrators discuss some unique items that are going on in their respective towns. Rena Weber tells us about a new tactic that the Rockville City Council is employing to help cut down city spending. The City Council Packets are now online and you can view those packets @ www.rockvillecity.org. This was done in an effort to cut down on delivery spending (specifically gasoline) as well as move the city in a more “virtual” direction where as in the future, all city documents will be online. Larry Lahr gives us an update on the Hometown Pride Days festival which is coming up at the end of this month. For more detailed information, look for the yellow flyers that feature times and locations for all of the events. Also, stay tuned to DigElog ROCORI as we will bring you more information as the 25th of July gets closer. Lastly, Dan Coughlin gives us an update about the waste water treatment plant in Richmond. There has been substantial work to help reduce the amount of cost and pollution at the treatment center, and we are pleased to say that the project has been a success. Thanks to all who were and who are continued to be involved with that effort. As always, stay tuned to DigElog ROCORI for all of your city update needs. This story is the second in a series of community updates that will be provided by each of the three city halls in the “Land of ROCORI.” In this story the mayor of Rockville Brian Herberg gives us an update about what’s going on in Rockville. On this Saturday, there is a fundraiser at the Granite Edge Café from 4p.m. to 7p.m. Mayor Herberg also updates us about a bill that is currently in legislature. Lastly, there is a meeting being held on April 30, to discuss the Rockville detachment issue and for updates on that evolving story, stay tuned to DigElog ROCORI. Cold Spring City Administrator Larry Lahr informs us about action the city takes involving nuisance violations. It is important for Cold Spring citizens to take care of any non-functional automobiles, old appliances, debris, or any other items that aren’t supposed to be out in their lawn. If you have any questions about your lawn or another lawn in your area, please feel free to call Larry Lahr at the city hall. 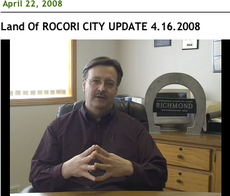 Lastly, Dan Coughlin updates ROCORI citizens about the Richmond cleanup. He details what can and can’t be brought to the cleanup, which takes place this Saturday. Also, he reminds us of the work that is being put in to replace one of the wells at the water treatment center. If there are any issues that arise from the work being done at the well, Dan, or another member for Richmond city hall will be updating you on DigElog ROCORI. Stay tuned next week for all of your ROCORI area news. This story is sponsored by The First National Bank in Cold Spring and Rockville, Minnesota. Your friendly full service bank that offers "Free" Online Banking and "Free" Photo Debit Cards. This story is the first in a series of community updates that will be provided by each of the three city halls in the "Land of ROCORI". In this story Rockville City Administrator Rena Weber talks about the recent bonding bill signed by the Governor that included $372 thousand for the ROCORI trail project. The project will expand the trail from Richmond through Cold Spring to Rockville, connecting with the Glacial Lakes Trail, the Beaver Island Trail, and the Lake Wobegon Trail. Once completed the total trail length will be 12.2 miles. Cold Spring City Administrator Larry Lahr talks about some of the plowing damage left on boulevards following this past weeks snow storm clean up. He also gives a quick glimpse into the future as to the key topics that will be affecting the area over the next few months and beyond. Finally, representing the city of Richmond, Dan Coughlin talks about everything from new water meters to some major street work in the city this summer. Coughlin supports the weekly update as a great way to keep the citizens of Richmond up to date in a timely manner. 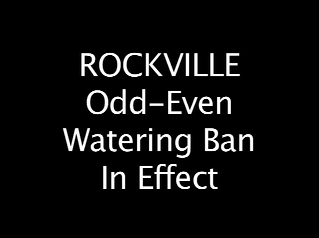 This story is about the ODD-EVEN Watering Bans that are now instituted in both the cities of Cold Spring and Rockville. 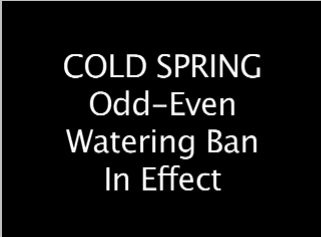 Because of the dry conditions we have experienced all summer the cities of Cold Spring and Rockville are forced to take water conservation steps. To do this an odd numbered homes should water on the odd days of the month (ie: 301 1st St. would water on Aug 7, 9, 11, 13 etc) and even numbered homes should water on the even days of the month (ie: 302 1st St. would water on Aug 10, 12, 14, 16... etc.) 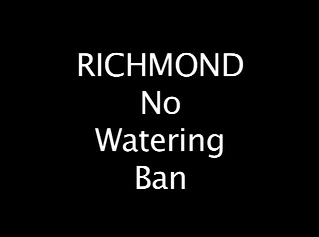 There is no watering ban in Richmond. City of Cold Spring Telephone 320-685-3653. Rockville City Hall at (320) 251-5836. In preparation for the upcoming Cold Spring Community Visioning Session, the 20/20 Vision Team has been recapping projects that emerged after the first visioning session in June 2004. This week, the Design Standards action team is highlighted. The formation of the Design Standards team occurred as a result of the MN Design Team community visioning process in June 2004. Residents, who either attended the visioning session or were surveyed prior to the session, responded about the importance of design standards as an element they wished Cold Spring would adopt. In addition, many wished Cold Spring would retain a small-town feel with a pedestrian-friendly environment. In a nutshell, the traditional look of a downtown became an important goal for the team. With this criteria, the design standards action team publicly solicited interested volunteers and proceeded ahead. John Frischmann chaired the group and his experience as an architect brought first-hand credibility. Team member Ann Harren also provided residential architectural experience, design insight, and landscape awareness. Team member and Stearns County historian, Steve Penick, brought a historical angle with insight into Cold Spring's past and how it could be incorporated into the design standards. The group met frequently and varied from five to nearly a dozen residents and business owners from the community, each bringing their experience to the table. Community business leaders were also invited to gain perspective on their concerns and to find common ground. It was a true community effort. The City's leadership was present at nearly all meetings and brought the City's viewpoint. When it came time to formalize the group's recommendations, the City hired a professional consultant from Municipal Development Group to ensure the ordinance was practical by building on the experiences of other communities. The consultant worked with specifics such as zoning, common practices for MN cities, legal issues, possible public concerns, drafting the document, and other issues. Even before this process began, City leaders were convinced the current zoning ordinance needed to be updated. So, the design standards team developed a series of zones (updating an outdated document that city staff stated was difficult to regulate due to its vagueness) and incorporated design standards for each. The downtown zone remained the most strict and outlying industrial zones were the most lenient. Design Standards included building materials, building height, landscaping, and architectural elements. The committee also attempted to form zones following existing business use and any new construction expected for these zones. As might be expected, some businesses did not fit into proposed new zones. While not a large number, it was hoped these businesses could be accommodated to continue their existing use while at the same time encouraging alternative locations within the city for new business coming into the community of that same type of use. Businesses not in conformity with the new standards would NOT be forced to make changes to their existing buildings until they do major remodeling or additions . The design standards team attempted to balance business concerns such as remodeling structures, lighting, signage and good common sense. The standards attempted to be flexible and affordable, yet raising building quality. Enhancing/retaining property values was a major priority. An extraordinary amount of time was spent on this community initiative, especially when the 20/20 land use team, city planning commission, and city council became involved in developing the zoning/standards document. After considerable time and review, a draft document went to the City Council for discussion at multiple public meetings. In consideration of feedback received during the public meetings, the draft document was revised and unanimously approved by the City planning commission and council in March of 2006. Next steps for the Design Standards team include the placement of welcome signs near entrances to the City. Please don't miss the next opportunity to provide your input about the future of Cold Spring. Your participation in the upcoming community visioning on September 18 is essential. The event begins at 6:00 PM with a complimentary meal at the St. Boniface Parish Center. The visioning session immediately follows. No reservations are needed, other than contacting the Chamber office at 685-4186 if you need on-site childcare or transportation to the parish center. A Spanish translator will also be available and attendance door prizes will be awarded. Your input is important and sincerely welcomed. Please mark the visioning session on your calendar - September 18 from 6:00 PM to 9:00 PM in the St. Boniface Parish Center - it will be time well spent. Local Senator Michelle Fischbach visited the Cold Spring Area Chamber in June and provided an update on this year's legislative session. In this story Fischbach talks about how the Land of ROCORI came out in the areas of the bonding bill, education and trails... just to name a few. In this story Dan Coughlin, City Administrator for Richmond brings us up to date as to the recent legislative session and how the new Richmond Sewage Treatment Plant came out in all of the funding bills passed. There are also up to date scenes direct from the construction site showing how the project is coming along. A special feature includes the new Richmond signs recently erected on the east and west ends of town on highway 23.